The workshops and books found in this website are replete with empowering tools and strategies to help co-creators process their major life challenges. Richard Harvey began writing the poems in his book, 20 Poems 20 Paintings A Creative Warrior’s Journal, and in his workshop Healing Through Creativity A Creative Warrior’s Journey in 2005. Insomnia from radiation therapy’s side effects opened a unique opportunity for him to process what was happening with creativity. A student of transformational thought, he infused his writing with messages about overcoming fears, focusing on desired outcomes, empowerment, living in the moment and gratitude. Please contact Richard Harvey with questions about the book, workshops, advocacy and healing through creativity. It's easy! 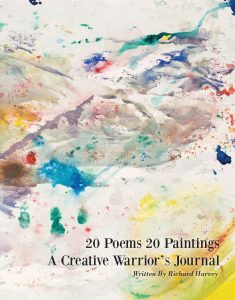 Available in print and digital formats CLICK HERE to pick up your copy of 20 Poems 20 Paintings: A Creative Warrior’s Journal today.